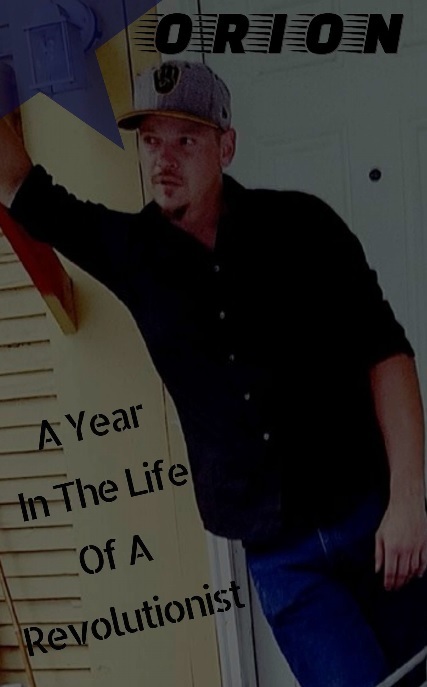 I started this blog several years ago, for various reasons, and it has afforded me some amazing opportunities by putting me in touch with authors and filmmakers seeking my opinion on their work. By putting that opinion out into the world, there is always the probability that your work will not be well received by the author or filmmaker who requested the review, but also from readers and other persons. I have always said that, above all, I will endeavour to give an honest review of the works submitted to me, or the ones I chose to buy and review. And I always have. This honesty was questioned yesterday by an author who requested a review of his work A Year in the Life of a Revolutionist. He accused me of lacking integrity via a comment on the review. For the record and the sake of transparency, I would like to outline the antecedent events leading up to my decision to make this post. The comment was sent to me for approval at 21h02, while I was watching a movie. I didn’t immediately see the notification on my WordPress (WP) app or the email notification sent by WP requesting that the comment be moderated (pictured below). Once my movie had ended I saw the comment and went into the WP app to read and approve the comment but as I opened the notifications page, the comment quite literally disappeared from the list of notifications. This has never happened to me before, and after logging onto the site via my laptop and confirming that the comment was no longer there, I decided that I would email the author in the morning to request that he resubmit the comment. It was 23h30 at this stage and I had decided to turn in for the night and sort all this out in the morning. I was just dropping off when my phone lit up and vibrated. I had received and email from the author. The first email, once again, spoke of my “lack of integrity”, and the accusation that I had probably delete the comment. I responded (pictured below). 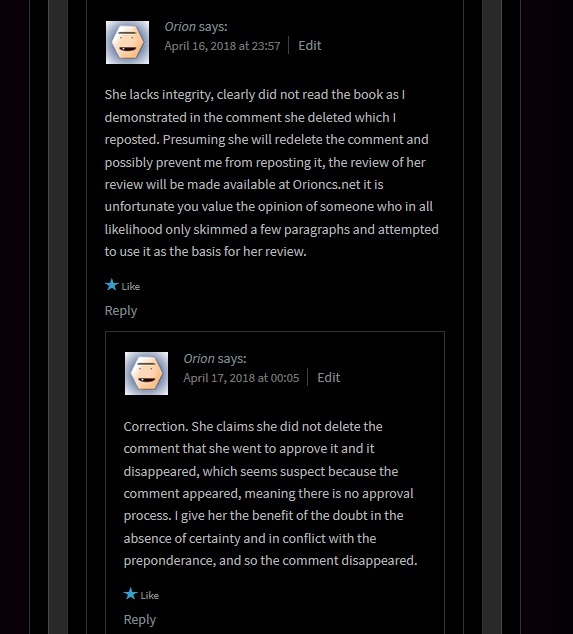 As soon as I had sent my first response, I got a notification showing that the author had resubmitted his comment. I immediately approved it, lest it disappear as well! And then hopped back onto my email and let him know that the comment had been approved. 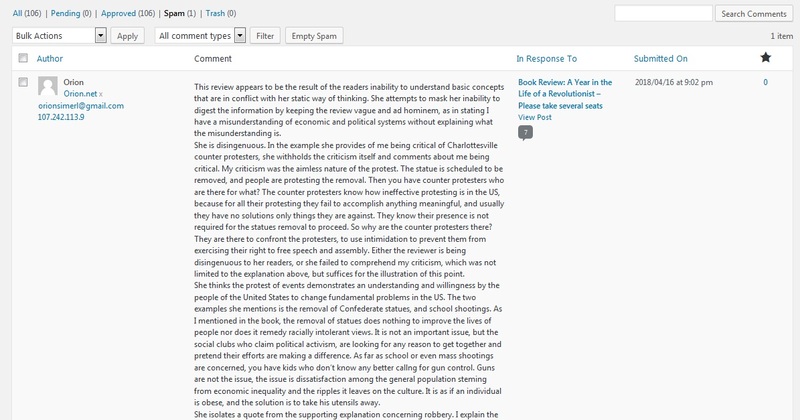 In the space of responding to his email, approving the resubmitted comment and then emailing him again, the author had managed to submit yet another comment, to a comment thread already on the site. And yet again, accused me of lacking integrity (pictured below). An additional comment was sent thereafter, which I subsequently only saw this morning, and approved it. First, all comments submitted to this blog are subject to approval by the blog owner, me. Second, I don’t think that I have ever deleted a comment or not approved a comment in the three years that the blog has been around for. Third, after having some time, not at almost midnight, to look into this matter, I found the original comment that the author had submitted. It had been moved to the spam folder (pictured below). I have no idea how this happened. Fourth, not only did I read the entire book, I did so twice. Last, I offered an honest, if not harsh, review as I said I would. The simple fact is that I have given some positive reviews and I have given some very negative reviews over the years. I do not let the reviews or opinions of others taint my perspective when I have agreed to review a book or film. I stay far away from reviews during this time. For films, I don’t even watch trailers, if I can help it. The negative reviews are not always well received but that comes with the territory. 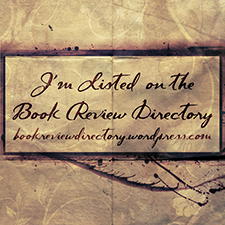 Some authors have been gracious, others have been disappointed, and yet others have asked for my help through beta reading upcoming works or assisting with editing in their older publications. I wasn’t expecting my integrity to be questioned, so I thought I’d present all the information here, for my readers to make make their own decisions. Your integrity is in question because your review is intentionally deceptive. You make claims about the author and his positions that are contradicted in the book, which suggests you may not have even read it. You begin with quotes that are not relevant to the book, but they do imply things about the author and the book which are not true. Your review covers nothing of any substance and relies on inference to assert things about the author that are untrue.